The deal between Bharti group and Tata Teleservices is yet another example of how swiftly things can change in business. 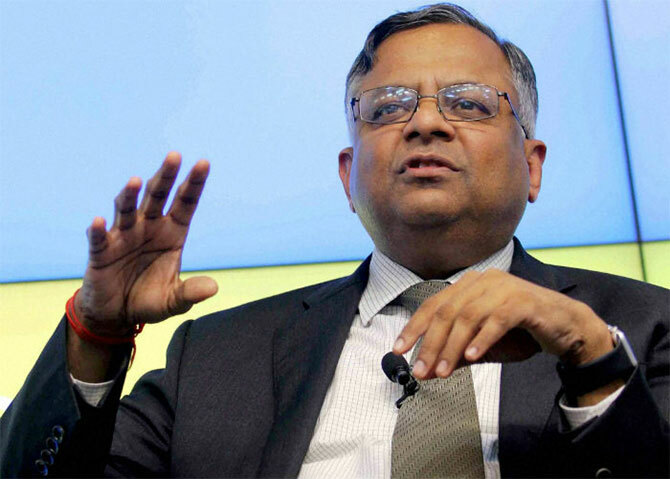 IMAGE: Tata Sons chairman N Chandrasekaran. Photograph: PTI Photo. The talks between the Tatas and Bharti had begun a few months ago but by the end of August the negotiations were not going anywhere. The deal between Bharti group and Tata Teleservices is yet another example of how swiftly things can change in business. A collapsed deal was brought back to life in the last five days, people close to the transaction said. The talks between the Tatas and Bharti had begun a few months ago but by the end of August the negotiations were not going anywhere. Sources in both companies indicated till the end of September that no deal was possible. Meanwhile, there were talks with other groups as well including Reliance Jio for a possible merger deal. That too didn’t work. The Tatas were now clearly looking at a closure of the telecom business and had begun sounding out customers and employees last month. Top officials of the Tata group including CFO Saurabh Agrawal and Tata Tele MD N Srinath visited the department of telecom headquarters in New Delhi last Friday (October 6) to inform the government about the closure of the telecom business. But, Tata Sons chairman N Chandrasekaran, or Chandra as he’s referred to, did not give up. In media interviews last weekend, Chandra said a tough call may have to be taken for the telecom business and that various options were being considered. It is learnt that Chandra met senior representatives in the government including the Prime Minister’s Office recently to discuss the telecom business. The government, sources said, is aware of the stress in the telecom industry and would not want any business to shut down at such a critical time. From the last weekend (September 30), things started moving. Bharti chairman Sunil Mittal flew to Mumbai to meet Chandra and his A team including Saurabh Agrawal and clinched the deal, sources said. “Yes, all in five days,” a source in the know confirmed. There was no need to open the drawing board all over again because discussions had taken place earlier. The two chairmen signed on the dotted line to merge their telecom businesses. While this might help Mittal compete better with newcomer Jio, the Tatas did not have to steer away from their 149-year history of never shutting down any company. 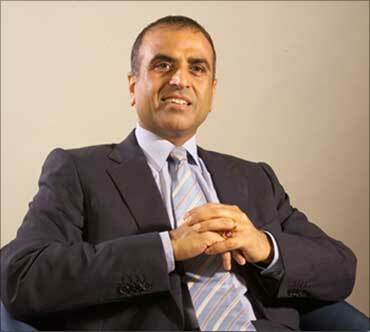 IMAGE: Bharti chairman Sunil Mittal. After taking Norwegian telco Telenor for virtually free earlier this year, leading operator Bharti Airtel has now acquired Tata Teleservices, taking consolidation to a new level in the stressed telecom sector. The cash-free debt-free deal, which will bring in over 71 MHz of liberalised spectrum and add 40 million customers to the Sunil Bharti Mittal-led company at a throwaway price, will also mean that the $103-billion Tata group won’t have to shut down its telecom business and worry about thousands of job losses. In its 149-year-old history, the Tatas have never shut down any major unit, and this merger deal is being seen as a face-saver for the group. With the acquisition of the Tatas’ wireless business, Airtel is getting a debt-free company while pushing its user base to around 321 million. The next largest telco in the country is Vodafone at a distant 208 million. However, once the Vodafone-Idea merger is completed, the total subscriber base would cross that of Airtel’s. Idea has 191 million users as of August. The consolidation in the sector is being seen as an outcome of the competitive tariff being offered by newcomer Reliance Jio, which has managed 128 million subscribers in just one year. The other gains for Airtel is that it gets 178.5 MHz spectrum (of which 71.3 MHz is liberalised) in the 850, 1800 and 2100 MHz bands across 19 circles and right to use Tata’s existing fibre network. It may also emerge as the preferred telecom partner for the Tata Group, executives said. Bharti Airtel will however take over the operational losses from November 1, sources said. Tata Teleservices will have to pay off the accumulated debt at over Rs 34,000 crore (for TTSL and TTML together). The two companies made it clear that all the past liabilities and dues would be borne by the Tatas. Out of the total deferred spectrum cost for the Tatas at an estimated Rs 10,000 crore, around Rs 1,500 crore is likely to be picked up by Airtel. The remaining Rs 8,500 crore would be paid by the Tatas to the Department of Telecom, sources said. Of course, the 5,500-odd employees of Tata Teleservices would not lose their job, a risk they would have faced in case of a closure. There’s no estimate yet of how many employees will be absorbed in the new set-up. Shutting down entails huge operational costs and therefore giving it for no cost is still a better option than shutting down, sources said. On completion, the proposed acquisition will further strengthen Airtel’s market position in several key circles, he added. The Bharti Board which met Thursday afternoon has approved this transaction. The two companies -- Bharti Airtel and Tata -- have agreed to merge consumer mobile businesses (CMB) of Tata Teleservices and Tata Teleservices Maharashtra. As part of the deal, Airtel will absorb Tatas’ consumer mobile business in 19 circles. Goldman Sachs (India) Securities Private Limited is financial advisor to the Tatas. The proposed merger will include transfer of all the customers and assets of Tata CMB to Airtel. It will also enable Airtel to bolster its strong spectrum foot-print with the addition of 178.5 MHz spectrum, according to a company statement. Tata and Airtel will work together to further explore other mutual areas of cooperation, that will be value accretive for both the Groups, the companies said in a joint statement. The employees of Tata will be demerged on the lines of the two businesses, ie, CMB and EFL (Enterprise and Fixed Line and Broadband), and post an optimal manpower planning will be moved to Airtel. Tata is also in initial stages of exploring combination of its enterprise business with Tata Communications and its retail fixed line and broadband business with Tata Sky. Any such transaction will be subject to respective boards and other regulatory approvals. Tata will retain its stake in the tower company Viom and will take care of the liabilities associated with it. Airtel offers 4G smartphone at Rs 1,399!